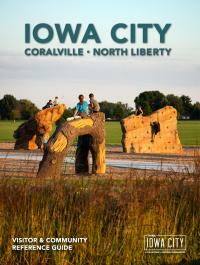 Get your one-stop guide for everything to see and do in the Iowa City, Coralville and North Liberty area. View the digital guide and/or request a guide to be mailed directly to you. No matter what you choose, you&apos;ll find our community ready to welcome you. All right here in the curious communities of Iowa City and all yours for the viewing in the Official Visitors Guide. If you selected "yes" to receive a monthly newsletter, by submitting this form, you are consenting to receive marketing emails from: Iowa City/Coralville Area Convention & Visitors Bureau, 900 First Ave/Hayden Fry Way, Coralville, IA, 52241, US, thinkiowacity.com. You can revoke your consent to receive emails at any time by using the SafeUnsubscribe® link, found at the bottom of every email. Emails are serviced by Constant Contact.